You’ll never know when accidents could happen. Cracked glass doors or door nearly torn off the hinges may go unnoticed especially if people are going in and out of your facility in a rush. Make sure that no one can further aggravate the situation by using Use Other Door Signs from Seton. Posting these signs can mean that a specific door is under maintenance and currently not fit for use. We also carry door signs with standard OSHA caution headers to give more sense of urgency to your safety message. You might not think much about it, but slightly damaged doors if not given immediate attention can cause accidents. Similarly, there are pathways that may not be safe for employees and visitors. 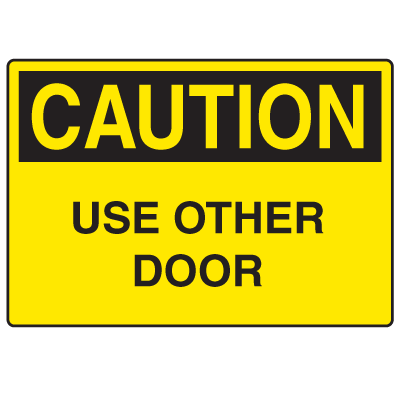 Warn people against these safety risks by posting Use Other Door Signs from Seton. 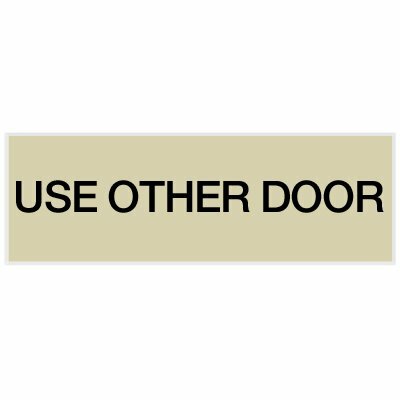 Whether you need to notify people of doors under maintenance or you want to remind employees to keep doors always closed, we have the perfect door signs for you. Manufactured from durable vinyl, these signs are supplied with a permanent back adhesive for fast and easy installation. If you’re worried that using door signs will ruin your office’s overall look, Seton can provide the perfect alternative for you. We carry engraved door signs that are guaranteed to complement your entire office interior. These signs are engraved with either architectural or gothic font typestyle with 4 beveled edges to reveal a tastefully designed border. Perfect for indoor office use, these door signs give off a professional and classy look. Choose between two sizes and a variety of color options and mounting method to suit your preferences.